Some days work ends up being really special. Like those days in elementary school when you went on a filed trip. Yesterday, one of my tasks led me to the Folger Shakespeare Library in Washington DC, just behind the Capitol. An amazing institution I had no idea existed. It was created in 1932 by Henry Clay Folger, President and Chairman of Standard Oil, and houses the biggest collection of Shakespeare works on the planet. Besides being a repository, it’s main function is as a research only library, open to doctoral students. I was fortunate enough to get a small tour of the building with now retired Head Conservator, Frank Mowery. Frank’s knowledge of the institution is unsurpassed. He is an interesting man that has a profound love of history and sees it’s influence everywhere. He was also kind enough to allow me to take a few pictures of some of the sights on the grounds. The man himself. 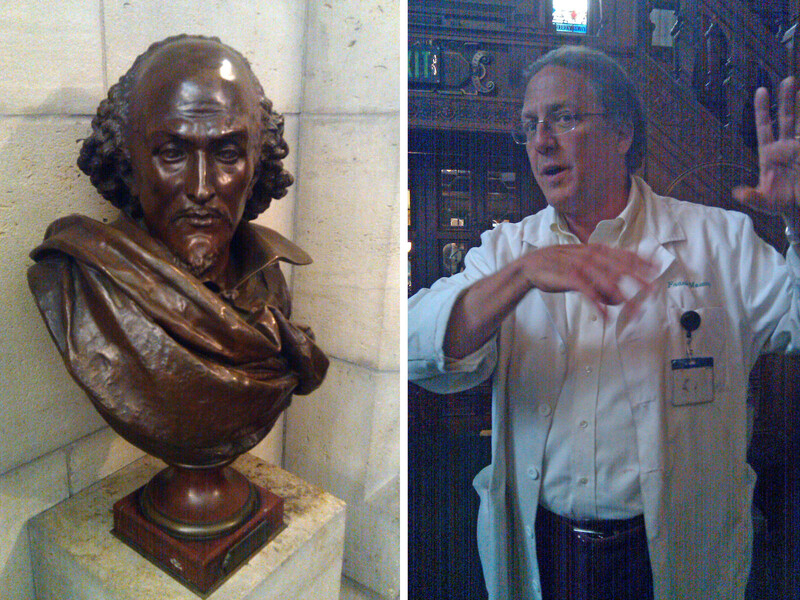 A bust of Shakespeare on the left and Frank Mowery on the right. There are busts of Shakespeare and every notable character in his works festooned throughout the building in every nook and cranny. This one in particular was in the lobby and reminded me of the one in the old Batman TV series with Adam West. I was more than tempted to try and tip it’s head back to see if it hid a switch that would reveal a secret door close by. Frank is a conservator specializing in works on paper. He has handled some of the most renowned pieces of art and documents in history like Degas Pastels and Lincoln Letters. No Shakespeare tour is complete without a stage. 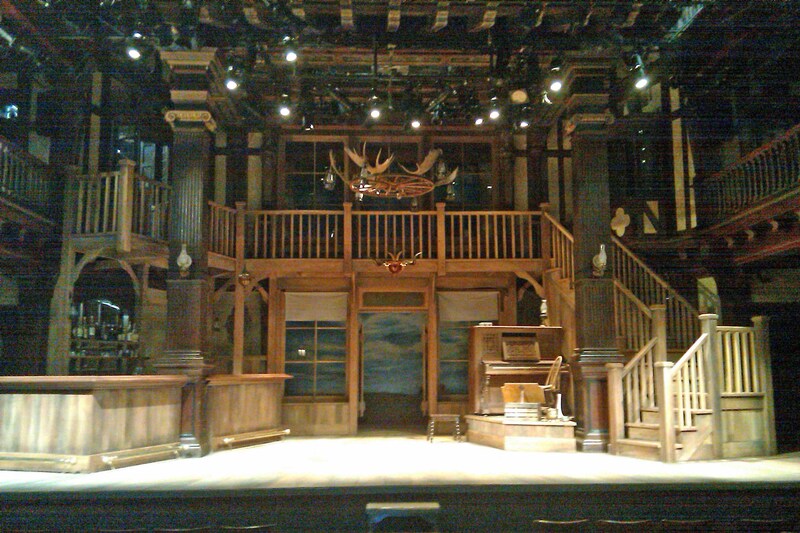 The Library houses a small 200 seat theater and a Shakespeare Company. The stage here is set for a production of “The Taming of the Shrew”. 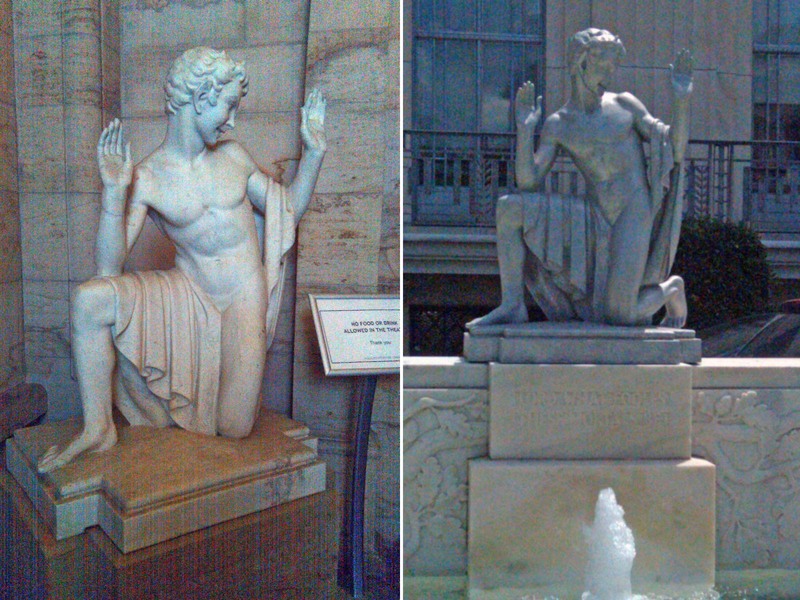 In the lobby of the theater is a restored marble statue of Puck from “A Midsummer Night’s Dream”. It originally sat outside the building above a fountain, but weather wore it down so much over time that they decided to bring it inside. Not before they cast it and created a new aluminum replica to put in it’s old place. Pictured here are two volumes of Shakespeare’s works. The one on the left is an original printing of the first ever volume of his collected works. It features all his plays, those produced and those never seen before and was published shortly after his death. It’s a crown jewel for any book collector as only 120 or so are still in existence. Each valued at over 5 million dollars. The book on the right is a stunning example of book binding of the period. It’s interior illustrations are believed to be done by a young Albrecht Dürer. At the heart of the building is a reading room that has an unmatch collection of Shakespeare paintings along the walls. Images of patrons, scenes from plays, characters and the oldest portraits of The Bard himself. 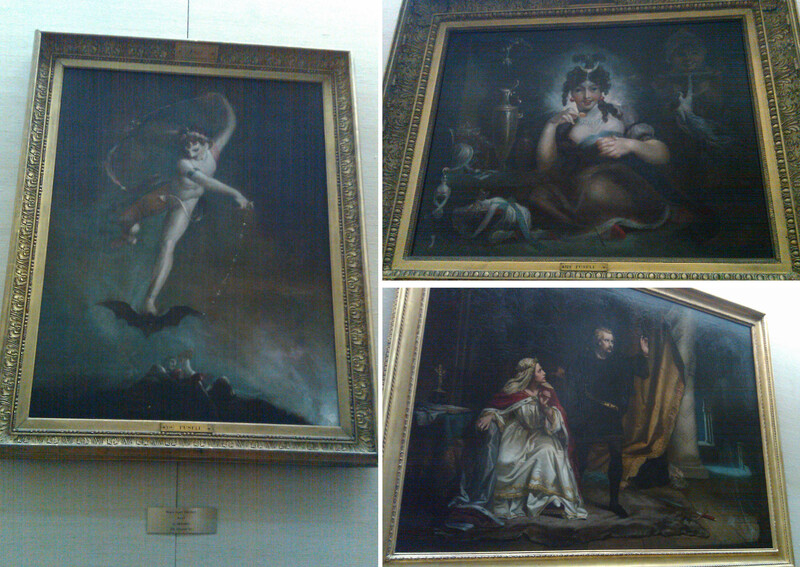 I don’t know my Shakespeare well enough to know who is depicted in each of these, but the one on the bottom is the scene from Hamlet where he mistakenly stabs Polonius through the curtain. As an illustrator I’m excited by these paintings as they are some of the earliest non-biblical Western Art. These artists who painted these were doing the same thing any book illustrator is doing today. Shakespeare inspired works were so popular, that at one time a gallery in Europe sold so many paintings that one year, they surpassed England’s total GNP. It’s heartwarming to think there was a time where art outsold an entire nation. 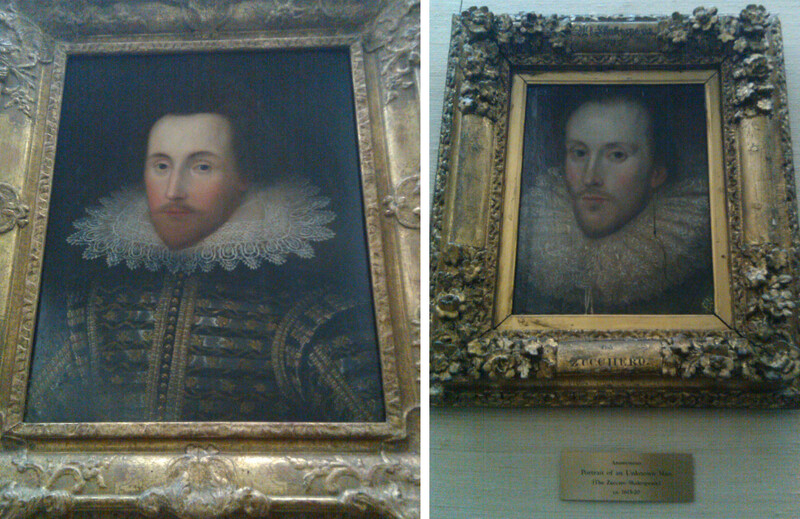 Finally, these two paintings are some of the first and oldest depictions of Shakespeare himself. Painted in the early 1600’s not long after his death. It’s these paintings where everyone gets their idea of what he looked like. These are just a handful of the works on display at the Library. I can only imagine what it has in it’s vaults. I picture the final scene in Indian Jones with crate upon crate going on ad infinitum. Each containing some long lost work not seen by human eyes in hundreds of years. Thanks for taking the time out and showing me around Frank. It was a real inspiration.